As renovations of the Pioneer Woman Deli and shop building progressed, the building began to share its surprising secrets with those working on the project. 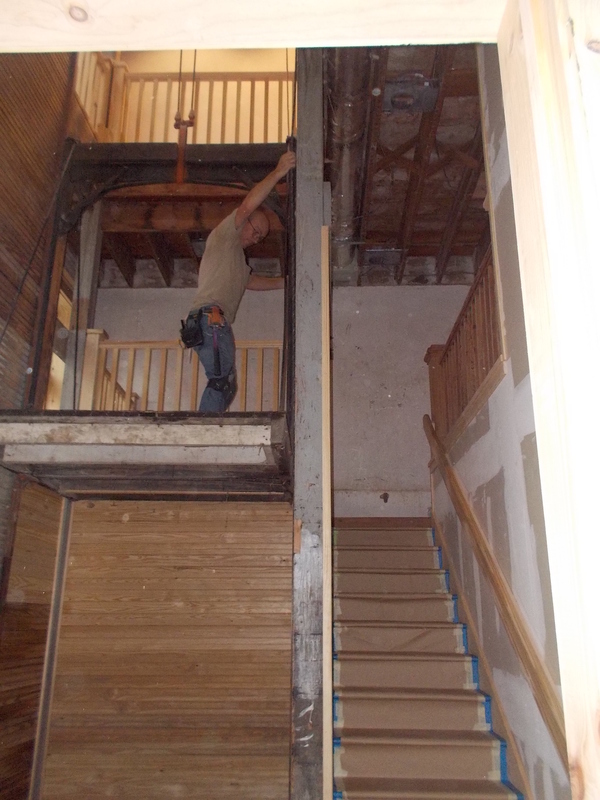 General contractor, Terry Loftis of J. L. and Associates, LLC, revealed some of these secrets. 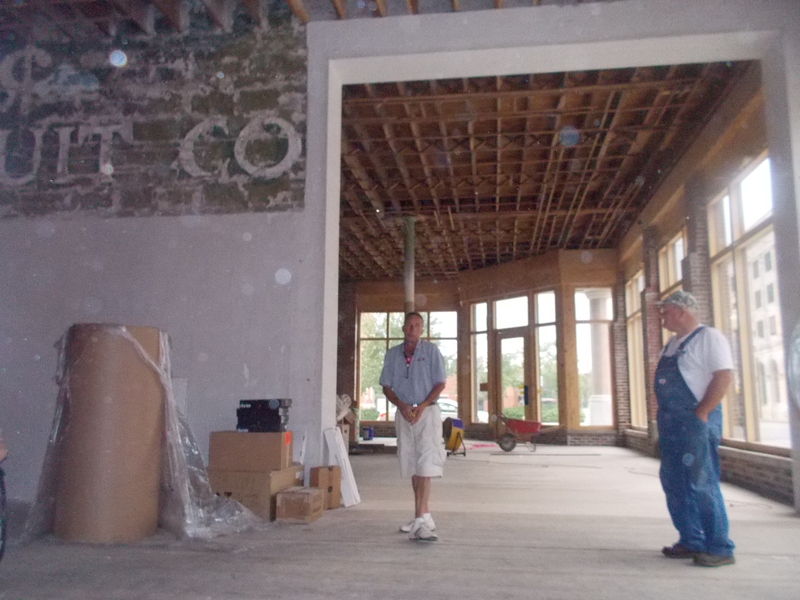 Contractor Terry Loftis shown on left describes the renovations. A. J. Hamilton and her crew started the project in summer 2012, and have done 90 percent of the demolition, Loftis said. Loftis said that the south side of the building, where the Osage Mercantile was originally located, is built on a crawl space. “Most people don’t believe that but if you go right underneath that plywood right there and I stand on the dirt, the finished floor below the building, it hits me about waist high,” Loftis said. “Both buildings the last 40 ft. have full basements. What most people really don’t know is that … those were speakeasys in the back of here,” Loftis said. Prohibition, resulting from the passage of the 18th Amendment to the U.S. Constitution, prohibited the manufacture, sale, transport, import, or export of alcoholic beverages. Illegal nightclubs called “speakeasys” flourished during Prohibition, which lasted from 1920 – 1933, when it was repealed by the 21st Amendment. After the speakeasys closed, some interesting items were left behind. “If you go down into the basement, and up over the retaining wall, you cannot crawl six-inches without hitting 15 empty liquor bottles that start at the retaining wall and come all the way to the front. Those will all be removed, because this side will actually have the heating and air conditioning ducts under the floor in that crawl space coming up through the floor. So we’re going to take all those out,” he said. Many of these bottles will be washed and put on display in the new Osage Mercantile, he said. Another wonderful find, on the south side of the building, was a large granite column, uncovered when they were working to restore the original entrance to the Osage Mercantile. “We found an old black and white picture that showed this diagonal entry. Sometime after that, they squared it off and covered up this granite column. We started tearing that out, were fortunate enough to find the granite column in pretty much the original shape it was, except for the top and bottom. 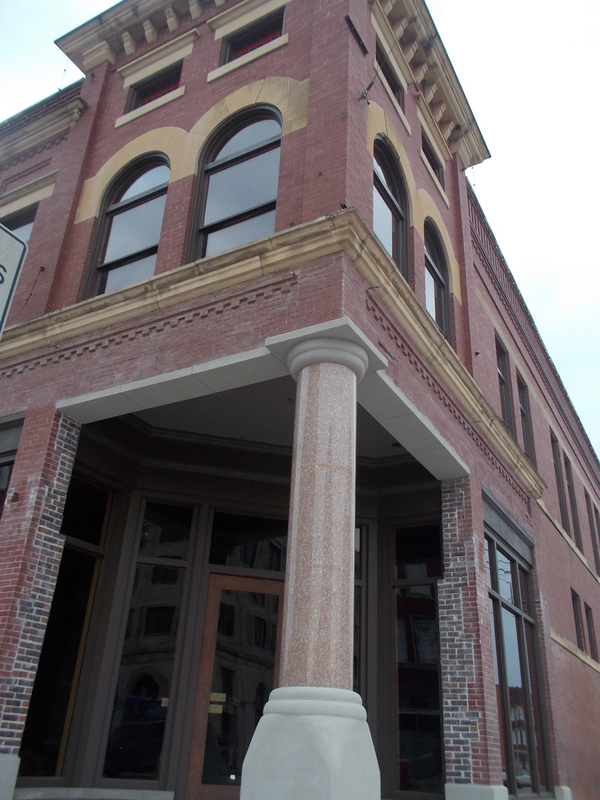 Original granite column found beneath facade at Pioneer Woman Building. In addition, several pieces of antique furniture found in the building are being refinished with plans to put them back into use. “That table you see was actually found in here under a pile of rubble. Along with the two benches, it was sanded, that was just stained yesterday,” Loftis said. The table and benches will be used in the conference area of the second floor offices, he said. 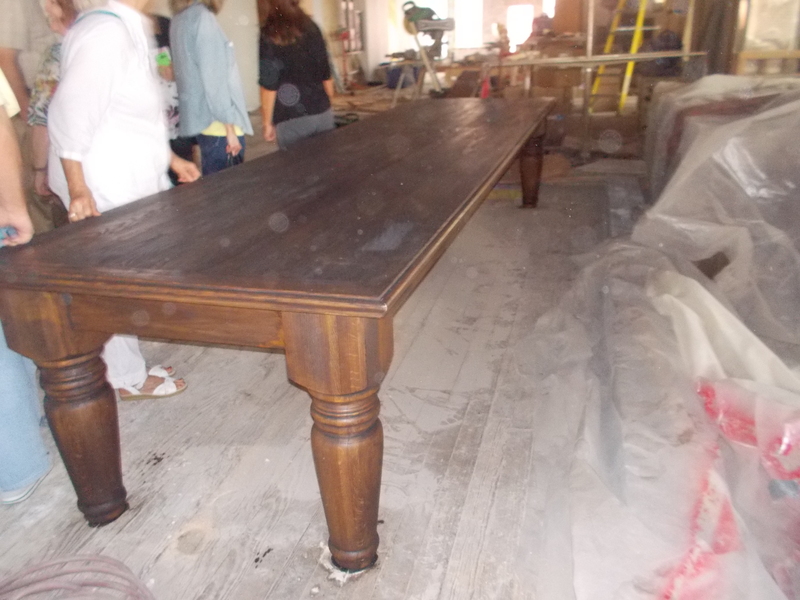 This restored piece will serve as the conference room table in the Pioneer Woman Building. “Over here you’ll see the old original display cases from the Osage Mercantile. 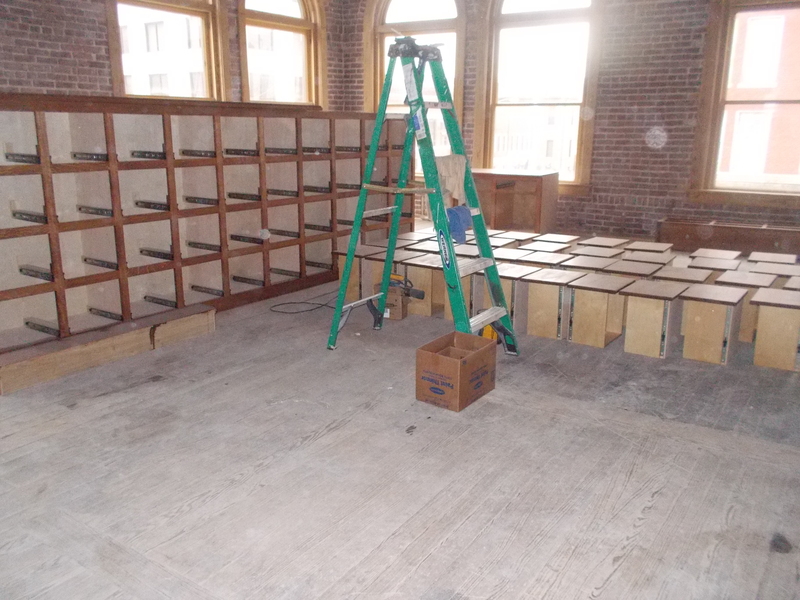 These are going to be broken down, refinished and they will be put back downstairs for merchandise display,” Loftis said. Furnishings found in the Pioneer Woman Building will be refinished and put back into use. He motioned to the southeast portion of the building, and said that during the work, “we found an entrance that none of us knew existed, this entry back there was probably covered up for almost 70 years. We found it and said, ‘make it match,’ so now you’ll have this entryway all the way around. As our time drew to a close, Loftis revealed one last secret. The building has many nooks to explore, but the Drummond boys’ favorite is a little room near the commercial kitchen, adjacent to the freight elevator, underneath the stairwell. Area below these stairs in the Pioneer Woman Building is a favorite spot of the Drummond boys.